The conference was inaugurated by Jose Tudela Aranda, Secretary General of the Gimenez Abad Foundation; Diana Chebenova, Head of Partnership and Information of the Forum of Federations; Maria Teresa Perez Esteban, Minister of Education, Culture and Sport of the Government of Aragon; and Antonio Cosculluela Bergua, President of the Aragon Parliament and President of the Gimenez Abad Foundation. The keynote address was delivered by Mr. Bob Rae, one of the founders of the Forum of Federations and former Premier of Ontario. He pointed out that we live in the era of “globalization” whereby we are affected by the forces of globalization and technological change, interconnection of nations and countries and movements of people, and we cannot stop or influence these changes. While the beginning of the 20th century was characterized by centralization and a strong concept of a nation state, nowadays the federal idea is affected by a desire for a greater autonomy and the resurgence of identity which requires greater diversity and pluralism in the political decisions. These current forces of change also affect education. In answering the question how can we achieve better federal education policies he suggested having a common measure for evaluating education results without insisting on rigid educational inputs. Nine case studies were presented along the 1.5 days sessions. Peter Busjager of the University of Innsbruck said that the 1962 constitutional reform in Austria perpetuated centralist vision and kept most of the competences of education at the federal level. Given that Austria achieves relatively good results at the international PISA evaluation, many argue that there is no need for more decentralization in the education sector. The current debate in Austria centers on the strengths and weaknesses of a traditional education system. Henrik Scheller of University of Postdam pointed out that in contrast to Austria, the German federal government has weak competencies in the area of education. The federal institutions setting in Germany have been marked by cooperative and competitive structural elements and constant tension between cultural sovereignty versus harmonization efforts of Bund, Lander, and the EU. There is a unique extra-constitutional institution in Germany called Standing Conference of the Ministers of Education and Cultural Affairs (KMK) created by the Lander before the 1948 constitution. KMK is an instrument of horizontal self-coordination of the Lander and some of its recent initiatives include efforts at standardization in regards to nationwide mandatory educational standards and central university entrance diploma, as well as promotion of educational research. Beatrice Ziegler of the Centre of Democracy Aarau pointed out that in Switzerland the Cantons have autonomy in primary and secondary education. However, in 2006, a constitutional proposal called for greater harmonization across Cantons that at the same time gave more power to the Confederation. The population voted overwhelmingly for this change, with around 85% yes vote, but the implementation still requires agreement of the Cantons via the Conference of the Ministers of Education of the Cantons (EDK). The differing educational results across the Cantons might be result of differing financial resources available to the Cantons. The division of competencies in education between the central state and the regions in Italy is very complicated and this has led to a referral of a number of cases to the constitutional court for clarification. The Good School Reform act passed in July 2015 aims to improve quality in education, increase student competences, decrease early school leaving, increase autonomy, and create a single database. Elisabeth Alber of the Institute for Studies on Federalism and Regionalism concluded that the education system in Italy is decentralized with heavy influence by the state; but there are differences in special regions in Northern Italy, and the constitutional bill of 2016 leads to more merit, more autonomy and re-centralization. In Spain, all Autonomous Communities (CCAAs) have the same power to develop their own educational models. The central government design guidelines and the CCAAs are responsible for the development and management of their education systems respecting these guidelines. For decades, experts and policy-makers in Spain have been concerned with regional disparities regarding education and there have been many efforts at ensuring equal educational opportunities for schoolchildren across the country. 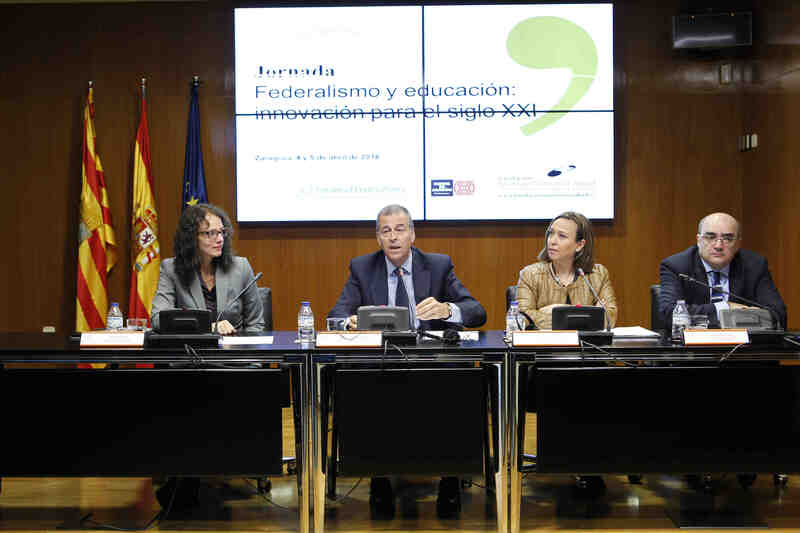 Currently, there is a broad ongoing discussion related to the educational reform of 2014; which, according to several political parties and CCAAs threatens the quality of the Spanish educational system and tends to a recentralization. The Spanish case was presented by Mario Kolling of Gimenez Abad Foundation and Xavier Rambla of Autonoma University of Barcelona. According to Deborah Wilson of the University of Bristol, the 1988 Education Reform Act introduced a broad range of reforms to the schooling system in the United Kingdom. These included the introduction of parental choice based on published school performance and increased autonomy over finance and management. Since 1997, there have been increasing differences in education policy across the four devolved administrations that comprise the UK: England, Wales, Scotland, Northern Ireland. As a result, the UK can be seen as something of a ‘laboratory’, both in terms of experimentation and innovation, but also with a view to enabling investigation of the effects of such reforms on educational outcomes in the different administrations. Constitutionally, primary and secondary education in the United States is a state responsibility; yet public education has become a shared state-federal function, as pointed out by Kenneth Wong of Brown University, a lead expert of the program. Over the years, the State-Federal relationship has gone through several phases of institutional changes. First, the federal government has established a grants-in-aid system to target federal support for students with particular needs. Currently, the grants from the federal government account for about 10% of the total public school funding. Second, since the enactment of the No Child Left Behind Act of 2001 (NCLB), the federal involvement has expanded outcome-based accountability for all children. After the expiration of NCLB in 2007 states are encouraged to set their own education policy priorities. Third, by replacing NCLB with the Every Student Success Act (ESSA) in 2015 the state dominance in education policy is returning, as ESSA places limits on federal prescriptions in low performing schools. Bronwyn Hinz of University of Melbourne pointed out that even though education is historically and constitutionally the jurisdiction of the states, recently the role of the Commonwealth government in education has been growing significantly in the following areas: funding, programs, curriculum, regulation, quality assurance and performance measurement. This has occurred through grants the Commonwealth makes to the States for schooling and through nominal intergovernmental institutions such as the Education Council and the Australian Curriculum, Assessment and Regulatory Authority (ACARA). The nature and extent of current involvement is linked with growing inequities and inefficiencies in Australia’s schooling systems. Policy debate focuses on teacher quality (including selection and training); the distribution of government funding between public and private schools; and the use (and misuse) of national standardised testing as an instrument to improve learning and accountability. To increase efficiency, effectiveness, and equity, most federations have instituted a variety of practices to afford influence over education policy by the central government. Canada is an exception, where there is little evidence of a centralizing trend in the Canadian education system. Jennifer Wallner of University of Ottawa pointed out that there are 13 schooling systems in Canada. Given that education is a provincial responsibility, remarkably, all 13 systems are very similar. Despite its decentralized system, Canada performs extremely well in international performance-based accountability assessments such as PISA. Two factors seem to underpin this success: a) high centralization at the provincial level (which means local school boards have little autonomy and independence from their respective Ministries of Education) and b) Canada’s fiscal architecture that allows for provincial fiscal capacity through tax revenues plus the unconditional grants that help to ameliorate the impact of economic inequalities between the provinces thus indirectly translating into greater inter-territorial equity in education outcomes. The closing remarks were delivered by Tomas Guajardo Cuervo, Director General of Human Resources and Training, Department of Education, Culture and Sport of the Government of Aragon and Isabel Casbas Arbues Castan, Director of the Provincial Service Zaragoza of the same department.